Ilion's first and last high school principals were both women. Between their administrations, eight men held that position. Miss Loretta O. Douglas was appointed Principal of the Morgan Street School in 1909. She held that position until 1920. She was the first principal of the High School at its present location on Weber Avenue. It would be another eighty-four years before another woman was appointed Principal of the high school. Ms. Rudd earned her bachelor's degree from Syracuse University in 1978. She received her master's degree from Syracuse University in 1983. She earned an advanced degree in educational administration from SUNY Oswego. For the first ten years of her career, she taught instrumental music in Camden. She entered the administrative field in 1988. She was Assistant Principal of the Lowville Academy & Central School. She was employed by Lowville Academy from 1988 until 1992. In 1992, she was appointed Principal of the Mount Markham Middle School. She later served as Superintendent of the Mount Markham Central School District until 2004. Renee Rudd was appointed Principal of the Ilion Junior-Senior High School in 2004. She held that position until the district merged with Mohawk Central School in the fall of 2013. 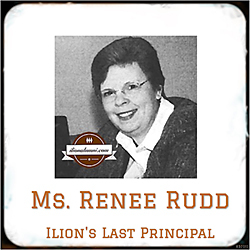 Ms. Rudd was the last principal of the Ilion Junior-Senior High School. Ms. Rudd then served as the first Principal of the Central Valley Academy, which is the high school that was created because of the merger. "Ms. Rudd is quick to give away the credit. She will explain that it was students who chose a new school name, mascot and school colors. It was guidance staff who melded the course offerings into an expanded course list. It was faculty who helped kick off the year with a school-wide, student icebreaker on opening day that earned Ms. Rudd and the school the 2013 Campus Event Planner of the Year. It is the continued collaboration of those teachers and staff that strive to raise student behavior, expectation and achievement. Her new assistant principal Richard Keeler, coaches, chaperones, office staff and volunteers all played important roles in Central Valley Academy’s first year." Principal Rudd was recognized with a Campus Event Planner of the Year Award by a company in New Hartford for the opening day celebration at CVA. The celebration began the merger of the Mohawk and Ilion school districts in 2013-14 to form the new Central Valley Central School district. The event began with a ribbon-cutting ceremony titled "A New Beginning" in the gymnasium, followed with a luncheon on the football field with a DJ playing music. Free CVA T-shirts were provided to all students, faculty and staff. They were also entertained by a performance by Mentalist Robert Channing. She initiated the steps, which resulted in the CVA Navy National Defense Corps of Cadets (NNDCC) classes. Ms. Rudd was convinced the JROTC program would benefit the entire Central Valley community. She presented her ideas and research to the Board of Education and they approved the process to move forward in November of 2013. By January 2017, the new CVA Navy National Defense Corps of Cadets (NNDCC) class had almost 70 students enrolled in the program. On Friday, May 9, 2014, at the Century House in Latham, NY, she was honored with the School Administrators Association of New York State’s (SAANYS) James E. Allen Award. The annual award recognizes a secondary school leader who has made significant contributions to education and leadership at the secondary school level and service to the community and professional organizations. The award recognized the challenges she faced. She had to begin the school year in a school building that was still under renovation. In addition, two rival student bodies were combined into one high school taught by a newly combined staff. Superintendent of Schools, Dr. Cosimo Tangorra, credited her with the first year success of the high school merger. "...it takes a leader to unite, to inspire and even to push people toward a goal. Renee developed a vision and found a way to share that vision with others," said Dr. Tangorra. Renee Rudd ended her 37-year career and retired as Principal of the Central Valley Academy on July 31, 2015. The board accepted her resignation "with deep regret and appreciation for her years of service and level of dedication," said board President Stephen Coupe.